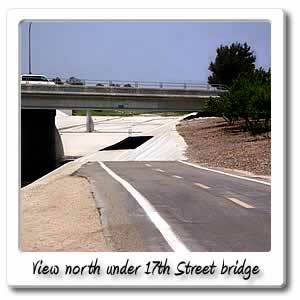 Welcome to 17th Street on the Santa Ana River bicycle trail. 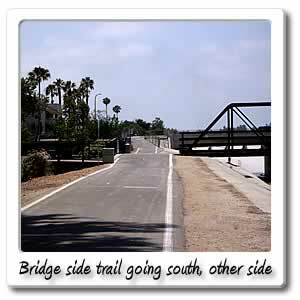 Just think, you're about a third of the way through on the Orange County section of the Santa Ana River Trail! 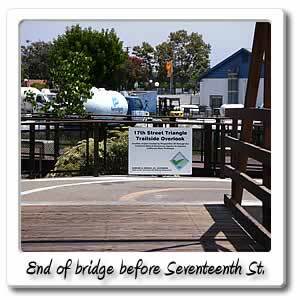 The 10 mile marker, will be up shortly after this entry point/exit at Seventeenth Street in Santa Ana. By going west you'll be going into the cities of Santa Ana and Garden Grove this is where the street name is Westminister Avenue. There are all kinds of businesses off of this street, not even a 1/4 mile away you are at Fairview Street, there you will find a Stater Bros. market, pizza place. If you keep going after a mile, there is a Subway and McDonalds. 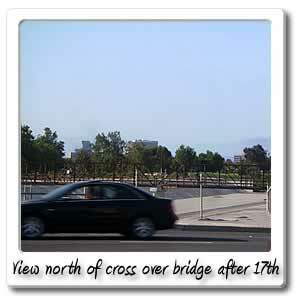 The best way to go is east off of the bridge, if you're heading north on the river trail. Less than a mile away is Santa Ana College at Bristol Street and along with the college comes alot of choices for food and drink and other services, along Seventeenth Street up to Bristol businesses line the streets, such as a burger joint, chinese food, and market. There are a proliferation of medical marijuana dispensaries for a good few miles, going east on Seventeenth, just look for a green cross sign, and you can find instant relief for fatigue, and your other ailments, that might arise during your ride. It's not suggested to medicate on the trail or surrounding areas, for this reason, smokeless methods are suggested. At Bristol Street, the choices for food and drink include the following Denny's, Subway, Taco Bell, Carl's Jr. The are several other services in this shopping center, such as a Target, Kohl's, Office Depot, and Northgate Market. For additional shopping needs, you can get off the next two entry/exit points at Garden Grove Blvd/Memory Lane or Chapman Avenue, to patronize the Shops at Orange, where more retailers are available. A few hundred feet after Seventeenth Street on the trail there will be a bridge, that will take you to the other side of the trail, that's on the Edna Park side. If you don't take the bridge and go straight, you're led to a small rest stop with benches and is called the 17th Street Triangle Trailside Overlook. If you continue this way you'll be led to the northeast on a 1/4 trail, and at the end you'll find Riverview Park at the corner of English and 19th Street in Santa Ana. There are rest rooms and drinking fountains at this park along with baseball fields. Just behind it is Riverview Golf Course.